Childhood snoring is more than just an endearing phase. Especially in children, snoring can point to something more serious. Regular, habitual snoring is typically indicative of a sleep disorder. The problem is more widespread than many people realize — roughly 10 percent of children snore regularly. Of this population, between two and four percent have Obstructive Sleep Apnea (OSA), a potentially life-shortening condition where the airway is partially or completely obstructed during sleep. Even if your child doesn’t have OSA, mild sleep-disordered breathing (SDB) can cause the same problems as sleep apnea. Whether a child has SDB or OSA, snoring may lead to long-term health issues. But snoring and its problems are treatable. Keep reading to better understand why your child snores as well as what treatments are available to solve it. What Is Sleep Disordered Breathing in Children? As we fall asleep, we unconsciously relax the muscles that support our tongue and airways. The tongue can fall into the throat and reduce the amount of air that can pass through. This paired with the relaxing of the soft throat tissues can constrict the airway. The resulting vibration of air trying to squeeze through a too-small opening is what we call snoring. Snoring is the most common symptom of sleep disordered breathing, which is a broad term and refers to any breathing problems during sleep. These difficulties can range from frequent, loud snoring to the much more serious obstructive sleep apnea, which is the medical name given to repeated episodes of partial or complete airway blockage during sleep. SDB can lead to a host of issues. When breathing is interrupted during sleep, the body registers the disruption as choking. Heart rate increases, blood pressure rises, and oxygen levels in the blood start to drop. There are two major causes of SDB — airway narrowing and insufficient oral development. If a child’s airway is narrowing and constricting, the most common cause is enlarged tonsils and adenoids. When these glands are swollen, a child often has no choice but to breathe through their mouth. This means that the tongue can’t sit properly in the oral cavity, which can lead to developing a constricted or narrowed upper archway. A wide range of dental and oral issues can contribute to sleep disorders. Children with developmental abnormalities with the jaw or tongue are at high risk for sleep disorders, as well as children with neuromuscular issues such as cerebral palsy. If the upper jaw hasn’t developed correctly, the tongue will be unable to rest properly during sleep. This can lead to sleep apnea. Crooked teeth can also displace the tongue and cause disordered sleep. Obesity also puts a child at risk for SDB. Because of their excess weight, overweight children tend to have fat deposits around the back of the throat and neck, which constricts airways. A range of conditions involving the digestive and respiratory systems can contribute towards SDB and OSA in children, such as asthma and GERD (gastroenterological reflux disorder). Many symptoms can indicate SDB or OSA. The most obvious sign of sleep disorders is regular, loud snoring. If snoring is interrupted by cessation of breathing, followed by gasping, snorting or waking from sleep, your child might have OSA. But there are subtler indications of sleep disorders. If possible, check on your child while they sleep and monitor their behavior during the day to detect symptoms that are less easily noticeable. While asleep, a child may be abnormally restless. They might sleep in unusual positions or sweat heavily while asleep. Bed wetting can also be a sign of a sleep disorder. Even if a child does not snore, their breathing might be heavy, loud and labored. While awake, a child suffering from sleep disorders may show much subtler symptoms. They might suffer morning headaches, or insist on breathing through their mouth. Their voice could sound nasal and pinched. Due to a lack of sleep, a child could exhibit several behavioral abnormalities such as excessive irritability, sleepiness, difficulty concentrating and hyperactive or aggressive behavior. Teeth grinding is also symptomatic of SDB. While grinding your teeth is assumed to be a sign of high stress, it actually signals insufficient oxygen is reaching the brain. If your child isn’t getting enough oxygen while asleep, the brain might push the lower jaw forward to help open the airway. At your child’s next dental appointment, have your dentist check for signs of teeth grinding like extreme wear, cheek biting and chipped or crowded teeth. Social signals like dropping school performance may indicate that something is wrong with a child’s sleep patterns. Unexplained changes in mood or motivation might lie with disturbed sleep. A sore throat and venous pooling, or “shadows” under the eyes, are also usually symptomatic of some sleep issue. Snoring is often assumed to be harmless. However, if left untreated, snoring puts your child at potential risk of side effects that may ripple throughout their life. During childhood, human growth hormone (HGH) is secreted during deep, non-REM sleep stages. Children with sleep disorders experience disrupted sleep cycles, which prevents growth hormone from being both produced and absorbed. A child with sleep apnea could fall off their growth curve, which can impact them into adulthood. Enuresis is the medical term for bed wetting. Most children will wet the bed occasionally, especially during the formative potty-training years. However, if the problem persists after age seven, your child may have a deeper problem. Sleep deprivation has been shown to increase nighttime urine production, which only exacerbates the issue. Childhood sleep disorders can also lead to cardiovascular diseases. Sleep apnea has been shown to increase the risk of adult heart failure by as much as 140 percent, and the potential for coronary heart disease by thirty percent. While obesity increases a child’s risk for SDB and sleep apnea, the reverse may also be true — recent studies show that childhood sleep disorders can exacerbate existing obesity and related diseases such as diabetes, as well as lead to a higher risk for developing obesity in adulthood. Sleep disorders can cause greater insulin resistance and daytime fatigue. Both of these tend to decrease daily physical activity, which, when left unchecked, can lead to excessive weight gain. If a child shares a room with siblings, snoring will impact their interpersonal relationships. One child’s snoring may affect the other’s child sleep, or cause irritation that will build up and carry on into daytime interactions. Snoring may affect more people than just your family. If your child spends time with other children in sleep-away settings such as birthday parties or summer camp, these negative impacts will hurt other children. In a social sense, the impact of childhood sleep disorders is contagious – when one child can’t sleep quietly, the surrounding children may not be able to sleep properly as well. The behavioral implications of childhood snoring can be severe. A child with sleep disorders may become increasingly moody and irritable and unable to function well relationally. The behavioral component of disordered sleep can easily spill over into school settings. In school, a child who doesn’t receive the right amount of sleep may become disruptive. Alternatively, depending on the child and the severity of the disorder, a child may instead be increasingly sleepy and inattentive. Like hyperactivity, this will detrimentally affect their ability to learn. Children who develop a sleep disorder in their first year are more likely to develop emotional and behavioral issues by the time they turn seven. Children with ADHD often exhibit difficulty with memory, concentration, organization and impulse control. 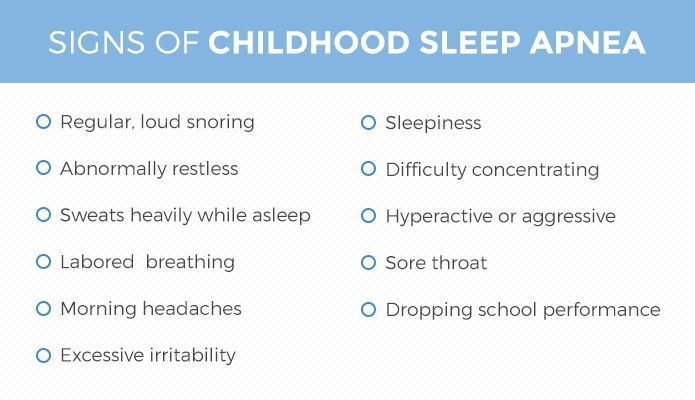 These are remarkably similar to the symptoms of OSA, and a child can be easily misdiagnosed as hyperactive when they actually suffer from a sleep disorder. Besides misdiagnosis, pediatric sleep disorders have been shown to result in the development of ADHD, which has serious long-term implications for a child’s development. Besides other side effects, childhood sleep disorders and obstructive sleep apnea has been shown to affect brain development. Sleep disorders may decrease the supply of oxygen to the brain during formative childhood years. It can interfere with the development of crucial pathways that determine mood and behavior. Deep sleep is an essential time for your body to regenerate — a child’s body is resetting and rebuilding. For children, sleep is when growth occurs, both physically and mentally. If a child can’t deliver enough oxygen to their brain during sleep, it may have concerning neurological impacts. In sleep apnea, the brain undergoes a period of oxygen deprivation. This oxygen starvation has serious implications. It can lead to memory loss and gradual brain damage. HGH is released during deep sleep and does more than help your child grow. It also aids proper brain development such as intelligence and helps shape behavior. HGH boosts memory, motivation and mental alertness. In children with sleep disorders, HGH production is inhibited. All of the factors influenced by HGH can suffer because of pediatric sleep apnea. But besides hormones and oxygen, the brain simply needs sleep. Without experiencing full, uninterrupted sleep cycles, the brain won’t ever fully rest. This, in turn, means that the brain can’t create new neural pathways, which slows brain development. Dental problems may not just cause snoring — snoring may result in dental and oral deformity. Sleep disorders can be part of a vicious cycle. Poor tongue posture can cause a narrow arch (because pressure from the tongue shapes the palate) which leads to a constricted airway forcing a child to breathe through the mouth rather than the nose. In order to mouth breathe, the tongue has to drop away from the roof of the mouth which leads to a narrow arch… and on and on. This is the connection between crowded dental development, snoring, and airway disorders. Crowding and snoring can be a clear indication that a child’s mouth isn’t developing correctly. The oral cavity holds the teeth, tongue and other soft tissues. It also contains upper airways in both the nose and the throat. Examine your child’s teeth. If they are crooked or cramped, it may be a signal that the jawbone hasn’t formed correctly. Airways may also be affected by this jaw malformation, resulting in a constricted airspace. Another cause may be teeth grinding. When a child grinds their teeth during sleep, it is a signal that their body is trying to widen its airways to breathe correctly. Unchecked, snoring can potentially lead to serious adult problems. But childhood SDB is often an easily treatable disorder. Before pursuing treatment, it’s important to determine the root of your child’s snoring. Not every snore points to sleep apnea — it may be as simple as inflammation from an allergic reaction. If allergies are at the root of your child’s snoring, eliminating exposure to the allergen will cure their sleep disorder without requiring further treatment. A physician may recommend a sleep study or polysomnography (PSG) to study your child’s sleeping patterns. Typically, a PSG is performed in a sleep laboratory or hospital. Physicians attach wires to the head and body to monitor brain waves, eye movement, heartbeat, muscle tension and oxygen levels in the blood. PSGs are not painful and can help doctors understand the root of a child’s sleep disorder. Most commonly, the cause of SDB in children is swollen tonsils and adenoids. If you suspect the problem may be a child’s tonsils or other tissue inflammation, have them examined by a pediatrician or otolaryngologist, commonly called an ear, nose and throat doctor. If your child has enlarged glands, surgical removal will resolve sleep disorders in 80 percent of cases. If your child is close to puberty, a physician may also recommend waiting — in many cases, tonsils reduce in size with the onset of puberty. Disordered sleeping may also stem from dental and oral disorders. For dental causes, your dentist can inform you about different oral sleep appliances to manage the problem or orthodontic interventions to correct them. Appliance therapy is less intrusive and more comfortable than the commonly used Continuous Positive Airway Pressure (CPAP) machine. Oral sleep appliances, in contrast with CPAP, are custom-fitted devices. They help to keep airways open comfortably, which allows a child to breathe properly. Especially with children, oral sleep appliances are an attractive alternative to more traditional sleep apnea treatments. More ideally, with early intervention we can correct the constricted airway with palatal expansion and advancement and myofunctional therapy designed to train proper tongue position and development. Poorly formed dental arches and small upper airways are the enemy of good breathing patterns. These are strongly influenced by the position and activity of the tongue during the formative years. We can help identify problems early so that they can be corrected. Our goal is to help children develop to their full potential. At Green Hills Dentistry, we believe in superior service and quality care. We’re here to help you discover the cause of your child’s snoring, and find the solution that works best for you and your family. We understand that childhood snoring can be a warning sign of something that can become much more serious if left unchecked. Many physicians will recommend a CPAP device to manage snoring and sleep apnea. This often works well to limit the affects of sleep apnea, but only when patients are compliant. We offer alternative options that can correct the underlying problem rather than just treating the symptom. Schedule an appointment and let us help you and your child get the rest you deserve. Next ArticleAre E-Cigarettes and Juuling Bad for Me? Previous ArticleWhat is Occlusal Equilibration? Visit Green Hills Family & Cosmetic Dentistry! Serving the Lehigh Valley Region.